Charlie's Chalk Dust Big Belly Jelly E-Liquid - Money Off! A fruity and juicy e-juice, the Charlie's Chalk Dust Big Belly Jelly E-Liquid is designed for those with a sweet tooth. The e-liquid blends delightful watermelon and blueberry jelly bean flavours. Charlie's Chalk Dust apparently started with some hot dogs, a distaste for cab drivers and a potential spiritual intervention. How much truth is in this story remains to be seen, but the results are the same; creative and inventive flavours that create a smooth vaping experience. Big Belly Jelly E-Juice comes in one size and three different nicotine strengths. Some of our stock of this e-liquid is nearing its expiry date and, in light of this fact, we are offering the affected stock for a discounted price of £4.19. Act quickly, as this offer is only available while stocks last! With its comfortingly familiar taste of jelly beans and juicy sweetness of blueberries and watermelon, you won't be able to stop vaping with Big Belly Jelly E-Liquid. This flavour is perfect to alleviate those nostalgic feelings, especially when your dentist won't allow you to have any more jelly beans! Big Belly Jelly has a combination of 70/30 (VG/PG). 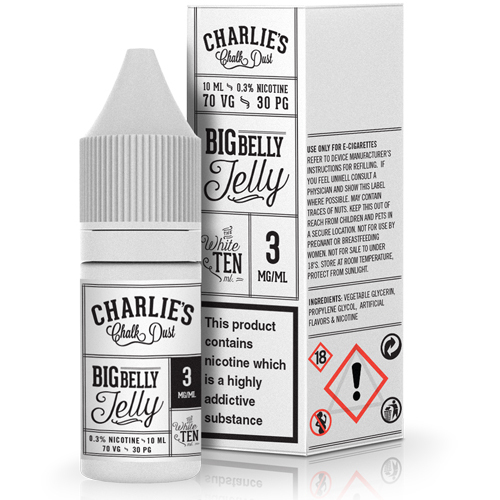 The Charlie's Chalk Big Belly Jelly is supplied in 10ml bottles only.